Sgt. 1st Class Pedro A. Munoz was born on June 30, 1957, in Quebradillas, Puerto Rico. He was a detachment operations and intelligence sergeant assigned to 1st Battalion, 7th Special Forces Group (Airborne) at Fort Bragg, N.C. He died Jan. 2, 2005, after he was fatally wounded while conducting offensive operations in Shindand, Afghanistan. During the combat action, Munoz was struck by enemy small arms fire and died of his wounds during his medical evacuation. Munoz entered the Army in February 1986 as an automated logistical specialist. He graduated from the Special Forces Qualification Course in 1990 and was assigned to the 3rd Special Forces Group (Airborne) and soon after deployed in support of operations Desert Shield and Desert Storm. In 1994, he deployed to Haiti for 7 months in support of Operation Uphold Democracy. In 1999, he was assigned to the U.S. Army Parachute Team, the Golden Knights. He completed over 300 static line and 4,000 free fall parachute jumps. 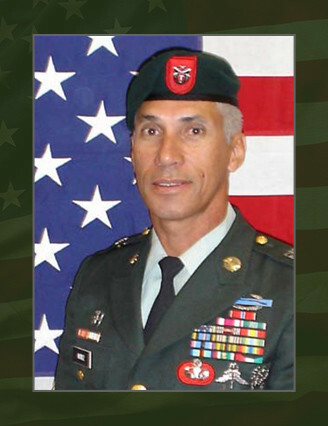 He returned to the Special Forces community in 2002, serving with the 7th SFG. His awards and decorations include the Bronze Star with Valor device, the Bronze Star Medal, the Purple Heart, the Meritorious Service Medal, the Army Commendation Medal, the Army Achievement Medal, the Good Conduct Medal, the Joint Meritorious Unit Award, the Armed Forces Expeditionary Medal, the Southwest Asia Service Medal, the Global War on Terrorism Expeditionary Medal, the Global War on Terrorism Service Medal, the Armed Forces Service Medal, the Humanitarian Service Medal, the Noncommissioned Officer Professional Development Ribbon, the Army Service Ribbon, the Overseas Service the Kuwait Liberation Medal, the Combat Infantryman Badge with 2nd Award Star, the Master Parachutist Badge, the Master Military Free Fall Badge and the Special Forces Tab. He was posthumously awarded the Silver Star for conspicuous Gallantry in Action in Afghanistan on Jan. 2, 2005. Munoz is survived by his wife, Gisela, and his daughter, Dalia.